A Kenya Wildlife Service (KWS) officer counts elephant ivory tusks on July 3, 2013 after a container destined to Malaysia was seized in a private yard in the Changamwe area, having come from Uganda at the ports of Mombasa. Officials seized almost one and a half tonnes of ivory hacked from poached elephants, they said Wednesday, the latest in a series of seizures by Kenyan authorities. Officials in the Kenyan port city of Mombasa seized almost one and a half tonnes of ivory hacked out of poached elephants, they said Wednesday, the latest in a series of seizures by Kenyan authorities. "The ivory was stashed in 69 bundles of several pieces and had been disguised as sun-dried fish," said Kenya Wildlife Service spokesman Paul Udoto. The smugglers tried to use smelly dried fish to hide the ivory—some 770 pieces weighing 1,478 kilogrammes—from sniffer dogs of the customs officers. "Some bags had worked polished pieces of ivory, while others had raw ivory," he added. The seizure comes just two days after US President Barack Obama signed an executive order launching a $10 million (7.7 million euro) bid to cut wildlife trafficking in Africa, with $3 million in assistance earmarked for Kenya. Export documents from the seizure show that the consignment had entered Kenya from Uganda on June 12, 2013, and was destined for Malaysia. 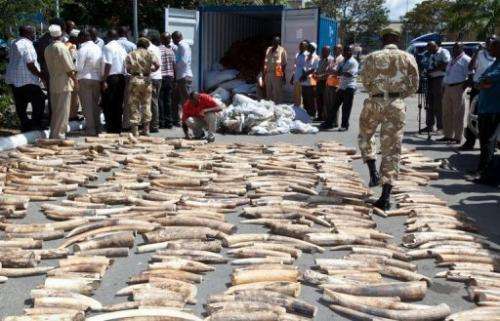 In January, two tonnes of ivory worth $1 million on transit from Tanzania to Indonesia were seized also at Mombasa, a regional trade hub. Ivory trade is banned under the Convention on International Trade in Endangered Species of Wild Fauna and Flora (CITES). Poaching has risen sharply in Africa in recent years. Besides targeting rhinos, whole herds of elephants have been massacred for their ivory. The illegal ivory trade, estimated to be worth between $7 billion and $10 billion a year, is mostly fuelled by demand in Asia and the Middle East, where elephant tusks and rhinoceros horns are used in traditional medicine and to make ornaments.